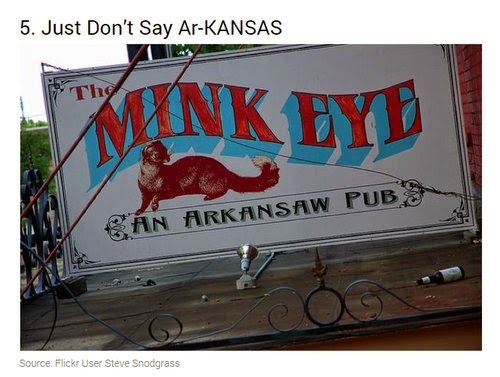 29 Things People From Arkansas Would Like Movoto To Get Right. I find it humorous when people who don't live in Arkansas try to quantify life here. But sometimes, the line is crossed. 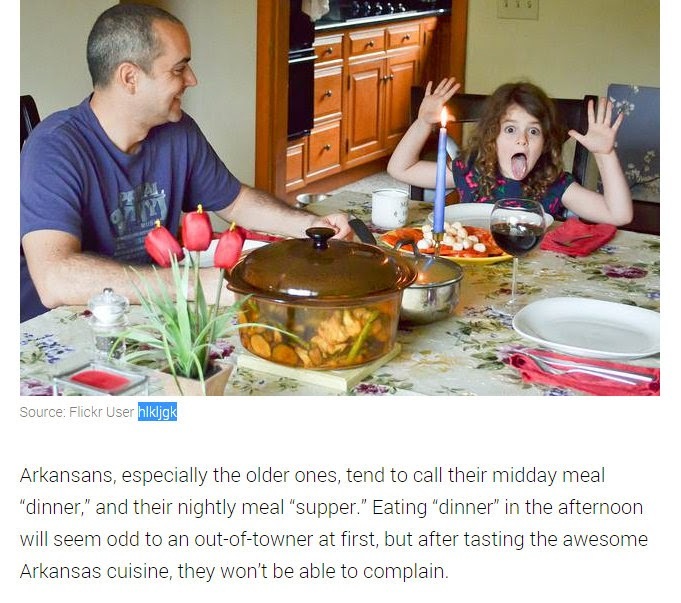 That's happened with the latest piece from Movoto, 29 Things People From Arkansas Have To Explain. What makes this funny is, hey, I'm about to explain to Movoto why maybe they needed to do better research. The original piece is here. I know it's intended to be funny and to drive people to Movoto's site. That's fine. Now, here's what you really should know. "1. 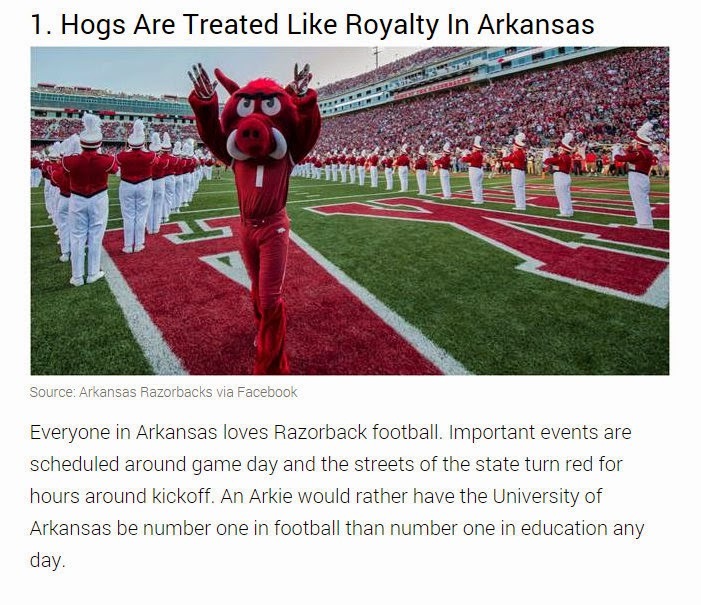 Hogs Are Treated Like Royalty In Arkansas." I can see where that might be apparent. But let me share with you the caption for this statement. Mr. McKee (the author of this web content), let me put this to you in words you would expect to come from an Arkansawyer: Them's fightin' words. 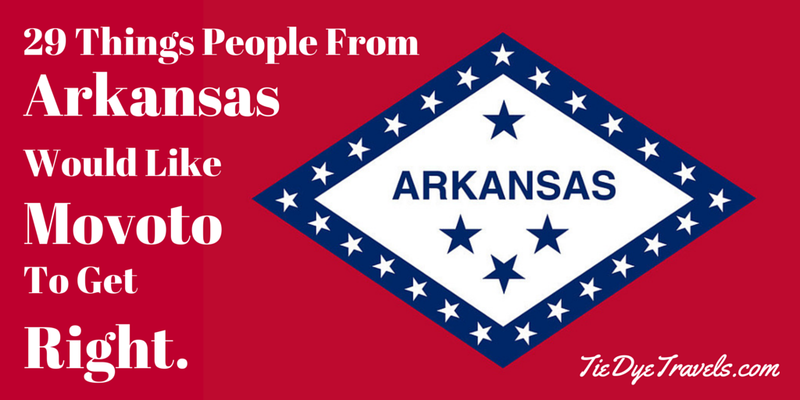 Sure, many people from this state support the Arkansas Razorbacks, but you will find few that will put a good team ahead of wanting our state to excel at education. Lumping us all together in a manner to suggest that we're all yokels who would watch the pigskin being tossed around by a winning team rather than having a well-educated and informed population is offensive. "2. Float Trips Are Better Than A Day At The Beach." This may actually be correct. At the beach, you may experience sunburn enhanced by an overabundance of solar reflections from vast expanses of white sands, overcrowding from tourists, the heavy pull of undertow, sand that will stay with you throughout your journey back to your abode, and of course jellyfish. 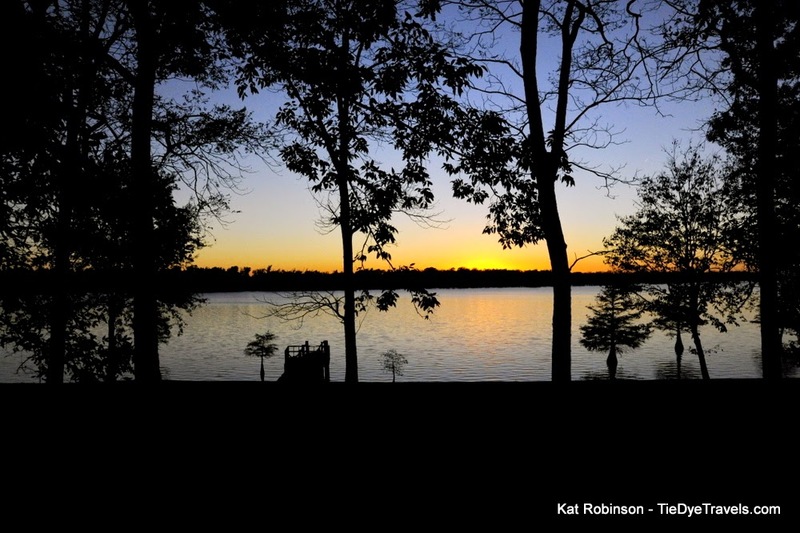 On a clear winding river (take your choice; Arkansas has 9700 miles of streams and rivers) under the cover of leafy trees, one's opportunity to float upon crystalline, cool currents while imbibing in one's favorite beverage and practicing the disengagement of worries from the soul is precious and savored. "3. 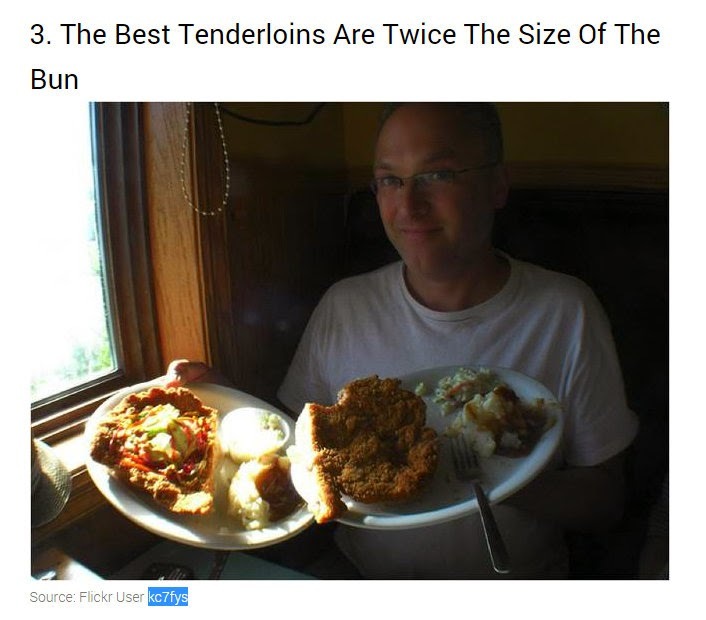 The Best Tenderloins Are Twice The Size Of A Bun." Mr. McKee, you didn't even try here. 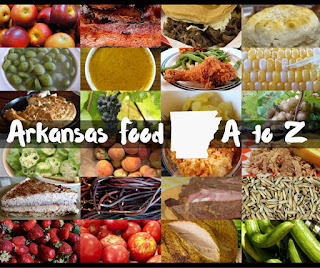 Over the seven years I've been covering food in Arkansas, I have traveled to well over 1000 restaurants. My ex-husband was a fan of pork tenderloin sandwiches, yet the only time we encountered them was from the Indiana-based vendor who sold them at the Arkansas State Fair. Pork tenderloins are from Iowa. By the way, the photo from user kc7fys? Yeah, Jonathan Charles is from Manchester, Iowa. Nice town. Not in Arkansas. "4. 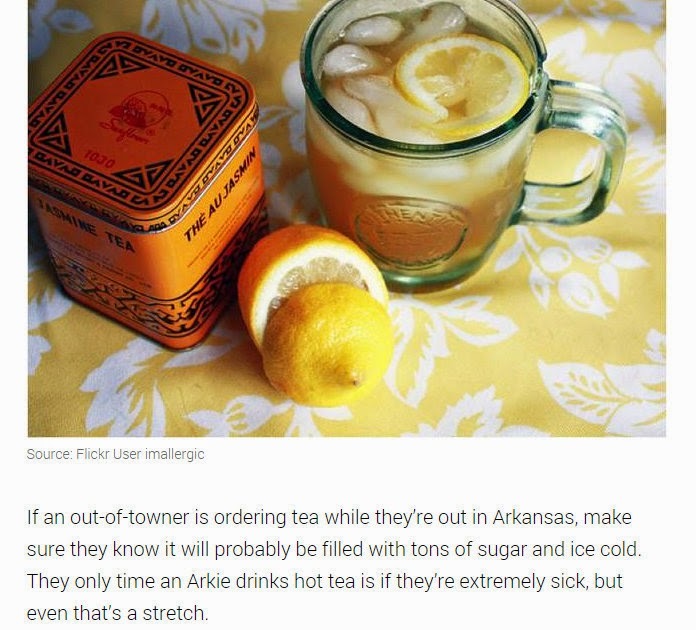 Arkansan or Arkansawyer? Who Knows?" 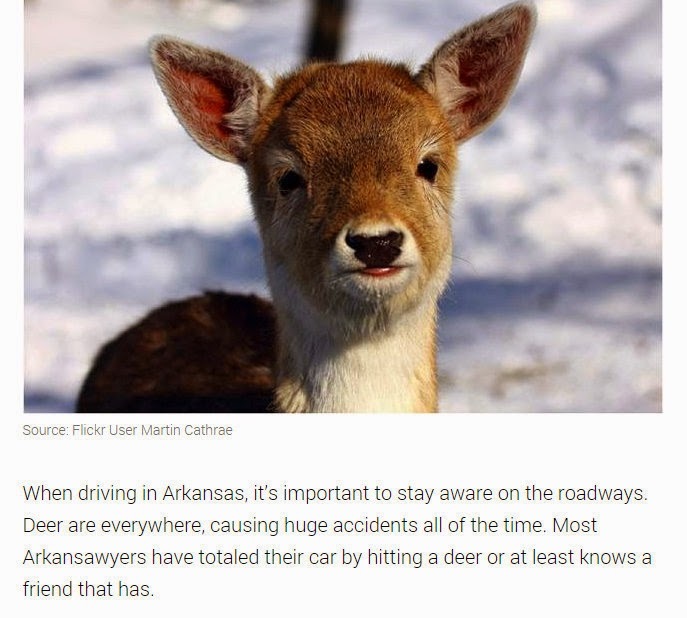 I could go into the details, but the Encyclopedia of Arkansas sums it up nicely. The TL:DR version you're searching for is either is acceptable. 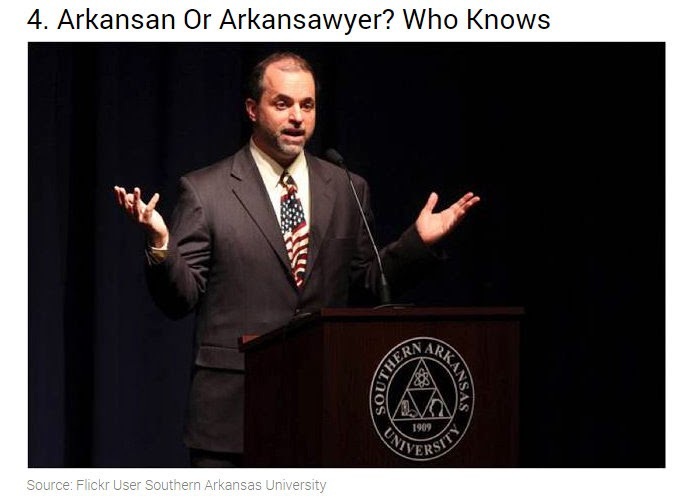 Also, what the heck does a photo of Joshua Drake, a Green Party candidate for Arkansas's 4th District Congressional Seat, taken during a debate at Southern Arkansas University back on October 4, 2012 have to do with what people in Arkansas call people who live in Arkansas? "5. Just Don't Say Ar-KANSAS." Well, you finally really got something right. The quickest way to determine that someone's not from around these parts is to see how they say the name of the state, or of its southwesterly mountains, the Ouachitas (that would the the WASH-it-ah Mountains), or one of its tiny burgs such as Solgohachia (sog-uh-HAT-chee), or of one of its counties like Lafayette (lah-FAY-et), or of one of its bustling cities, maybe El Dorado (el doh-RAY-do) -- from which you captured this funny sign that appears on a popular foundling bar. We're actually legislated to say it that way. 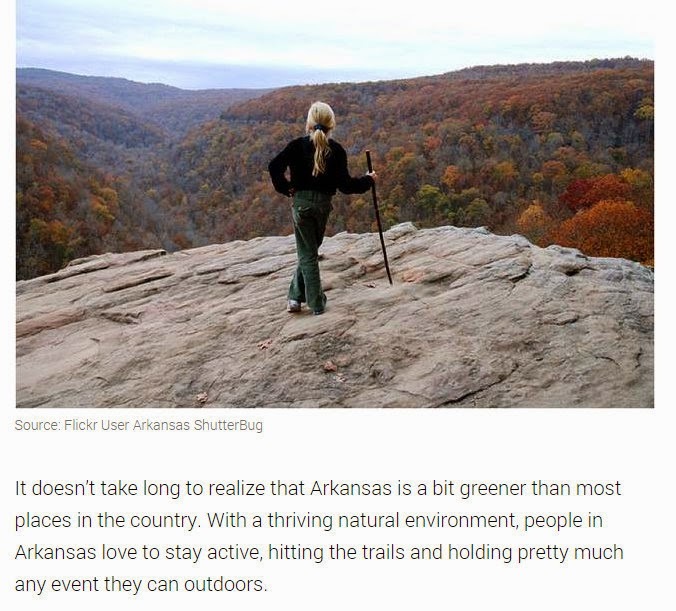 See, the name Arkansas comes from descriptions of the Quapaws, a native tribe to central Arkansas. The sas sounds like saw because it's a French description. You can thank Jean-Baptiste Bénard de La Harpe and Henri de Tonti for that. Then later, in 1881, after review by legislative committee, a resolution was passed declaring Arkansas to be pronounced Ark-an-saw. Chocolate gravy on a biscuit at Calico County, Fort Smith. "6. Two Words: Chocolate Gravy." NO ONE wants bacon bits in their chocolate gravy. What the heck? 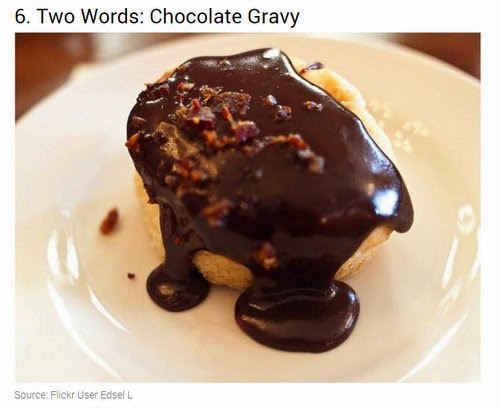 Yes, chocolate gravy is something that can be considered popular in Arkansas and which has a heritage that dates back to the early 20th century. 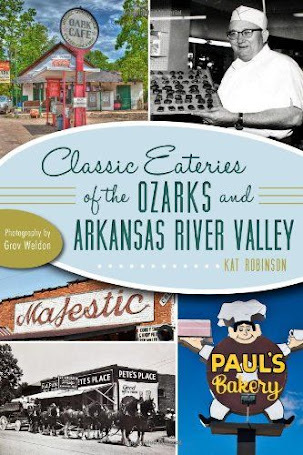 It was a cheap sweet stuff, called gravy because any flour-thickened butter roux was considered such, and it is served in Arkansas restaurants. But bacon bits take the cake. Dude, next time you're searching for images, make sure you get them from Arkansas instead of Oberlin, OH native Edwin Little's Flickr stream. "7. Directions Are Given In Time, Not Distance Here." Really? You think that's just Arkansawyers? Even Siri tells you how long a journey is going to take. Google Maps, too. MapQuest, even. 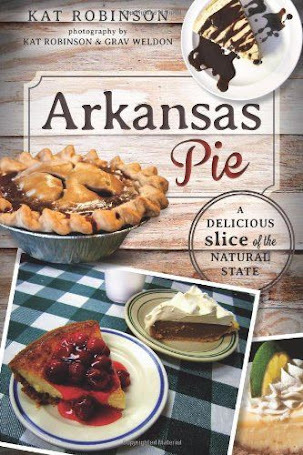 And dude, really, so far you're striking out on most Arkansas images. 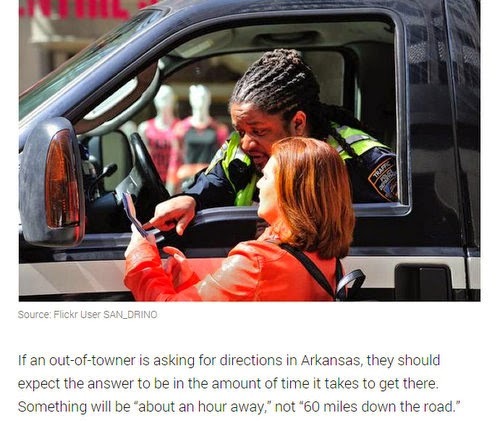 A dread-locked traffic cop in NYC giving directions to a random woman while being watched by mannequins (or Autons, if you watch Doctor Who) has absolutely nothing to do with The Natural State. "8. Rotary Tillers Are The Next Big Thing In Racing Here." Forget about the next big thing. Tiller racing in Emerson's been going on nearly a quarter of a century now. And yes, it's as awesome as you might imagine. "9. 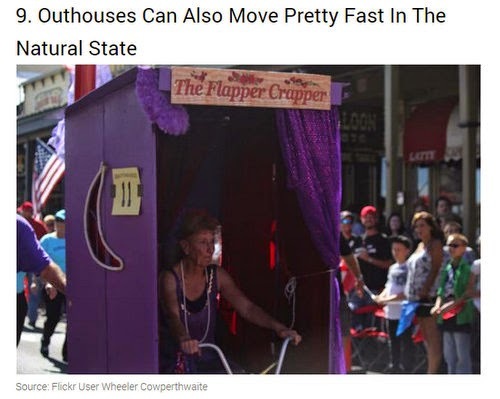 Outhouses Can Also Move Pretty Fast In The Natural State." I would love to contradict you here, but in the case of Beanfest's annual World Championship Outhouse Races, it's true. indoor toilets are the norm here. The two-decker executive model at Booger Hollow's been retired eight years now. "10. People Tend To Stand Up And 'Call Those Hogs' A Lot." That's an assumption right there. We're not all U of A alumni. Arkansas has many laudable colleges and universities -- and for folks in the Arkansas Delta, folks are just as likely if not moreso to whoop and holler over the Arkansas State University Red Wolves. There's also that whole matter of "a lot." Sure, in bars or at football games or rallies, that happens. Political gatherings, okay. It's generally frowned upon at Arkansas Symphony Orchestra concerts, visits to our fine museums like Crystal Bridges Museum of American Art or the Arkansas Arts Center, within libraries, at weddings or funerals (unless the betrothed or the deceased is a Razorback fan, of course, and only tastefully hollered when appropriate). "11. 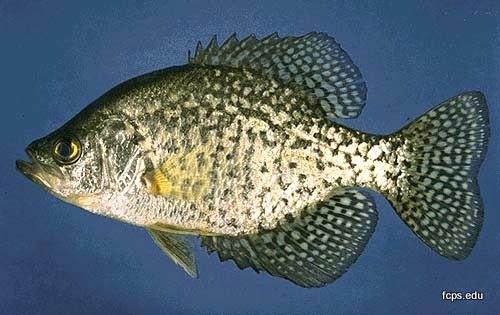 There’s Nothing Wrong With Eating Crappie." the right invite or you're willing to catch your own, you're in for a succulent fighting fish that's relatively easy to clean and delightful in flavor. Also, you might want to know it's pronounced "CROP-ee." However, you probably want to give finchlake2000 at least a cursory message asking permission to use his photograph. For one, it appears Grant and Chad got themselves a fine mess of crappie down on Finch Lake in northern Louisiana. For two, finchlake2000 did clearly list this notice on his About page: "All my photos are for viewing on Flickr. Do NOT copy or reproduce for any reason or in any way without my permission." That's why I'm not posting it on my site. "12. 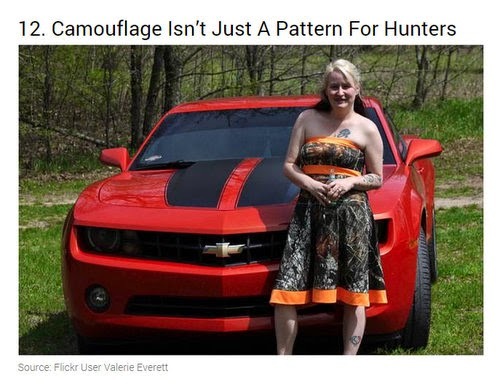 Camouflage Isn’t Just A Pattern For Hunters." How this is different for just about any southern state, I couldn't tell you. But it's rude. I'm in a pickle right now because I'll be appearing at an event requiring camo in just over a week and I don't have a single camo object. I've lived here all my life, too. Also, there's no evidence Amanda Benns got married in Arkansas. That's her, by the way, in your photo there. On her wedding day. "13. A Gunshot Doesn’t Always Mean Danger Here." We are taught from a young age the proper way to handle a weapon. That doesn't mean folks in Little Rock or Jonesboro or Fayetteville leave the office at lunch and go shoot supper. (16) (A) Any church or other place of worship. That means while a particular church can choose to allow concealed handguns on the premises, in general it's not allowed. Also, your photo comes from John Lustig, a Minnesota native who might not be so happy you just put a photo of Nate, an underage minor with a gun, on your website. "14. Coke Can Mean Pretty Much Anything In Arkansas." 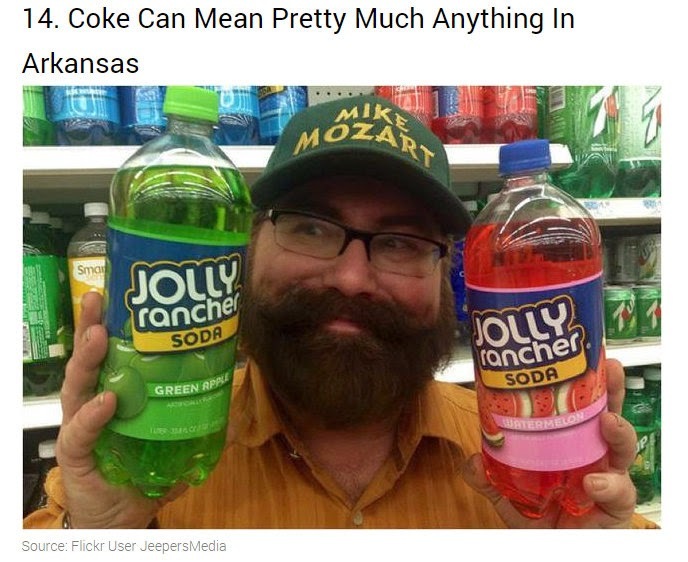 You know, Mr. McKee, you could have searched "Arkansas Coke" or something and come up with a better photo. Mind you, Mike Mozart is a funny dude, but he's from NYC, and I suspect this photo was taken there, too. I refer you now to the Pop Vs. 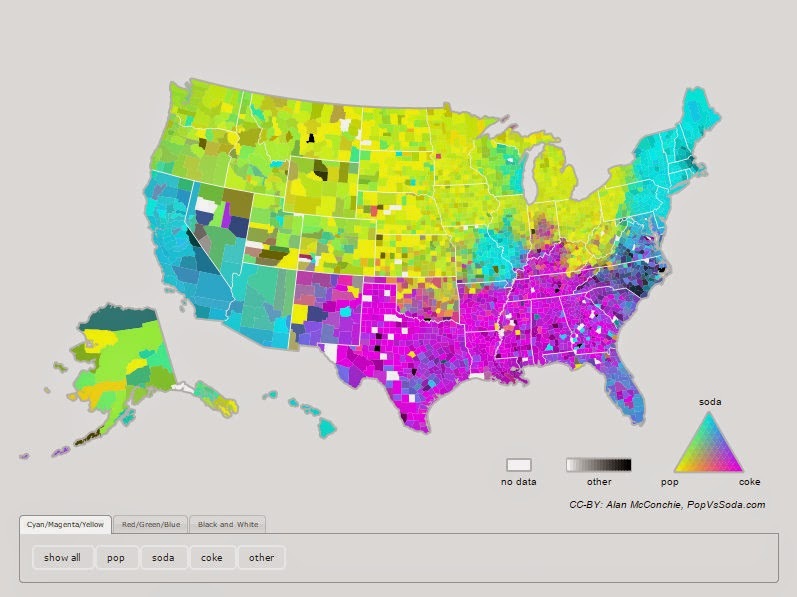 Soda page, which actually graphs out what parts of the U.S. refer to soft drinks as soda, pop or Coke. As you can tell from this handy graph, yes, Arkansas does prefer the term "Coke;'" however, so does Texas and a majority of the South with the exception of Florida. In my family, if you want a brown carbonated beverage, it's a cola. I have no idea what we'd call what Mr. Mozart is holding up in that photo, since Jolly Rancher soda sounds abominable. "15. Folks Here Are Always Prepared For A Storm Warning." To not be prepared for whatever weather is possible would be foolhardy. 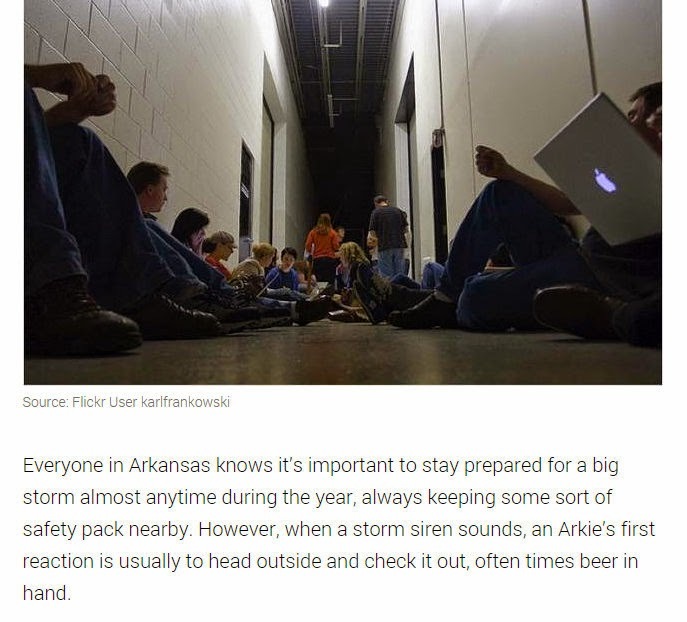 Yes, Arkansas is unfortunately blessed with a rather large number of cyclic tornado outbreaks; our ability to stay prepared for such potential emergencies (as well as also looking out for flash floods, heat waves, ice storms, locusts and earthquakes) has limited the amount of casualties from such weather events. However, the idea that we all go outside and look at impending doom with an alcoholic beverage in hand is deplorably insulting. I usually set down my iced tea before checking the weather, and if we're under a tornado warning, I am in my hidey-hole. Also, Karl Frankowski's image was taken in Minneapolis. "16. 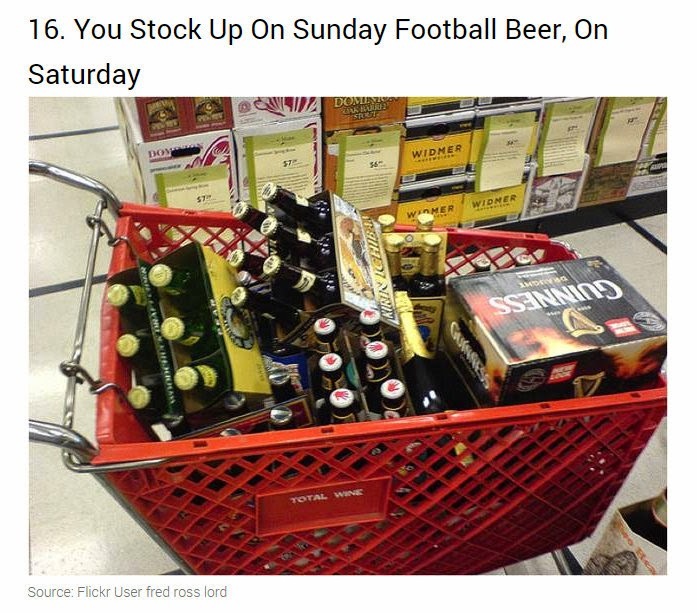 You Stock Up On Sunday Football Beer, On Saturday." If you're talking about beer consumed at home, sure. You can obtain a single drink at a time at many Arkansas restaurants on Sunday. It depends on the county. And if you're talking about that beer cart, Fred Ross Lord shot it in McLean, Virginia. "17. 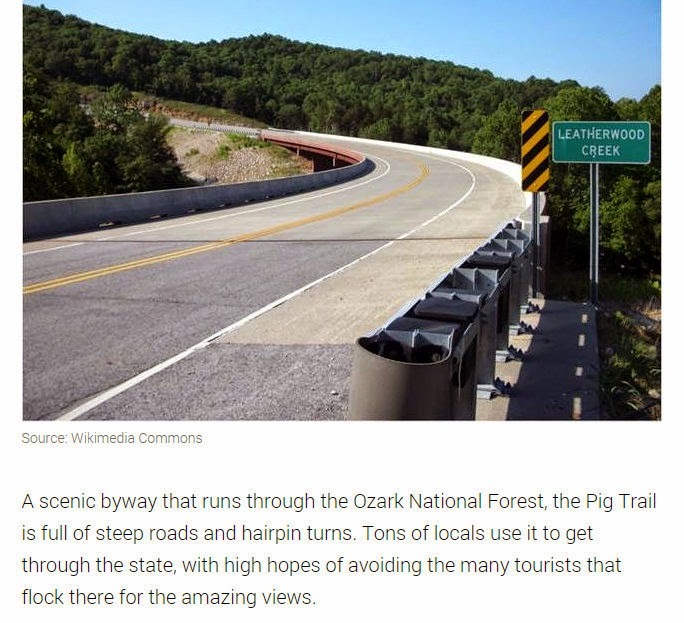 People Drive the Pig Trail For Fun." Yes, some do. I do. It's gorgeous. But "tons" of people don't use it to get around the state. It's an alternate route for people traveling from Ozark to Fayetteville -- a distance that can be traversed with greater haste on I-49 or the Boston Mountain Scenic Byway (old Highway 71). However, the image displayed is located on US Highway 62 just to the west of Eureka Springs -- within spitting distance of Thorncrown Chapel. Try again. "18. 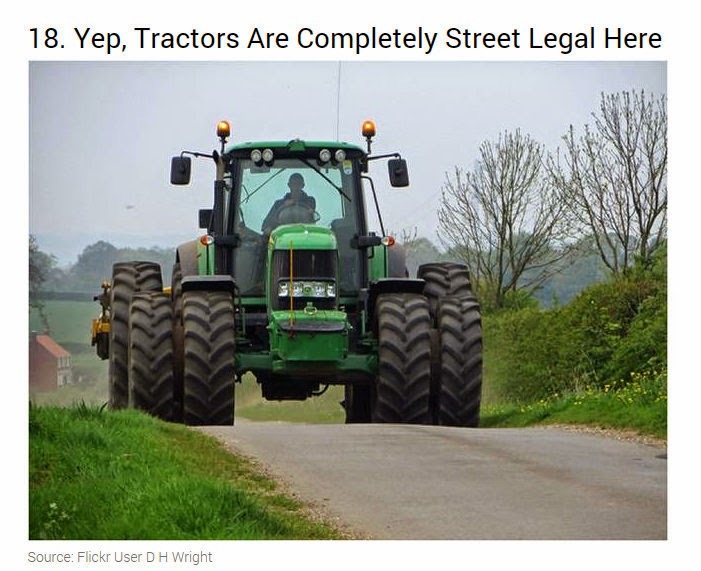 Yep, Tractors Are Completely Street Legal Here." 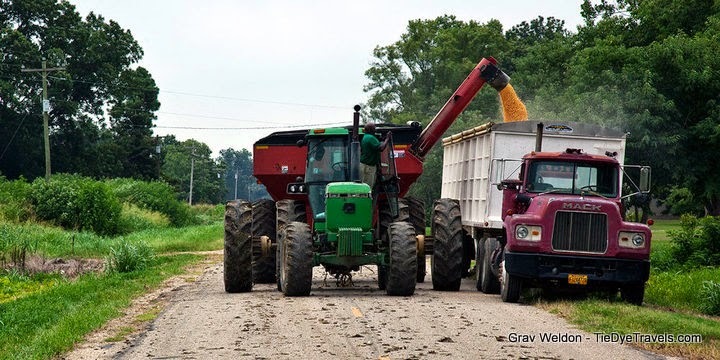 Leaving aside the fact that your photo for this entry didn't even come from the United States (photographer David Wright cites this as taken at Deepdale, England), no, you can't take tractors on just any road in Arkansas. In particular, this has become a problem for proponents of I-555, a proposed connector link to be developed along US Highway 63 between Turrell and Walnut Ridge, passing through Jonesboro. While most of I-555 has already been upgraded to interstate standards, there's a small legal issue. Several farmers in Poinsett County have land on either side of the St. Francis Floodway, which they can only access by crossing said waterway on US Highway 63. Tractors are not allowed on any officially designated interstate highways in Arkansas. This isn't just in Arkansas, by the way. Here's a handy booklet of information about tractors and other agricultural equipment allowed on American roads. And here's a photo of an actual tractor on the road here in Arkansas, courtesy Grav Weldon. "19. Deer Aren’t All Cute And Cuddly." Yes, absolutely. Deer are in abundance here... except for in areas around the poor fellows out there who haven't bagged one yet this hunting season. We know to watch for deer at night. And during the day, too. However, the cuddly fawn in the photo taken by Martin Cathrae at Parc Omega in Montebello, Quebec is a danger to no one. Unless he grows up and turns into this buck. "20. There’s A Very Good Reason It’s Known As The Natural State." You finally got one right. The view from Whitaker Point is astounding. Most folks, though, go for the shot below. "21. Everything Can Be Deep Fried." Dear heavens. Well, if you were talking about the Arkansas State Fair, you might have a point. But you don't. While fried foods make the news, most rural Arkansas natives are perfectly happy with side dishes of fresh, seasonal vegetables or canned garden delights in the winter. 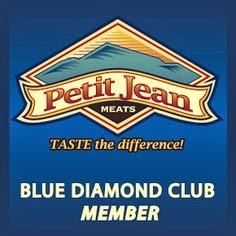 Fresh fish, steak, pork, venison, smoked meats and even spaghetti are on the menu here. Everyone reading this from Arkansas knows I can go on FOR DAYS on this subject. 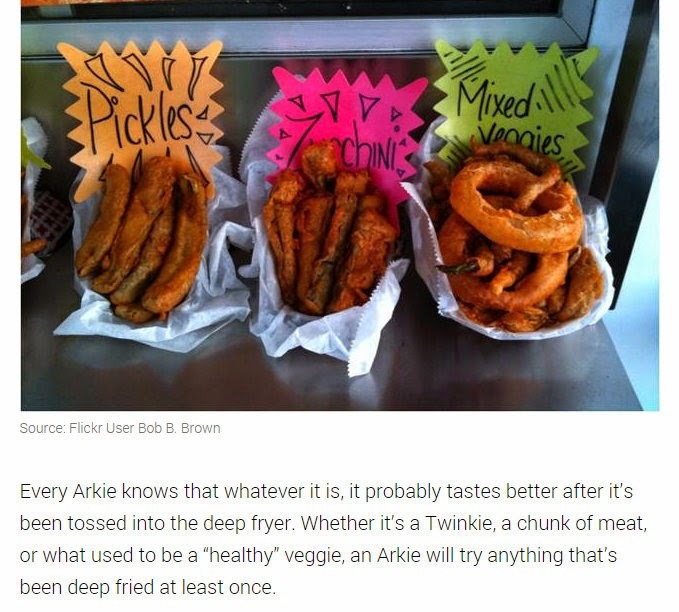 Yet, if Arkansas is so enamored with the concept of battering and deep frying, then why nick one of Bob B. Brown's photos from the Miami-Dade Fair? "22. 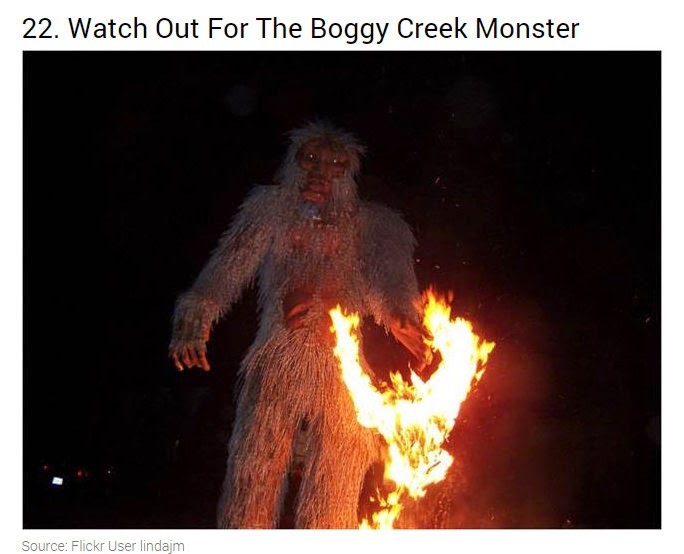 Watch Out For The Boggy Creek Monster." Outside of the whole Fouke Monster issue, for some reason this article shows a photo of Bigfoot burning in effigy at a California youth camp. "23. 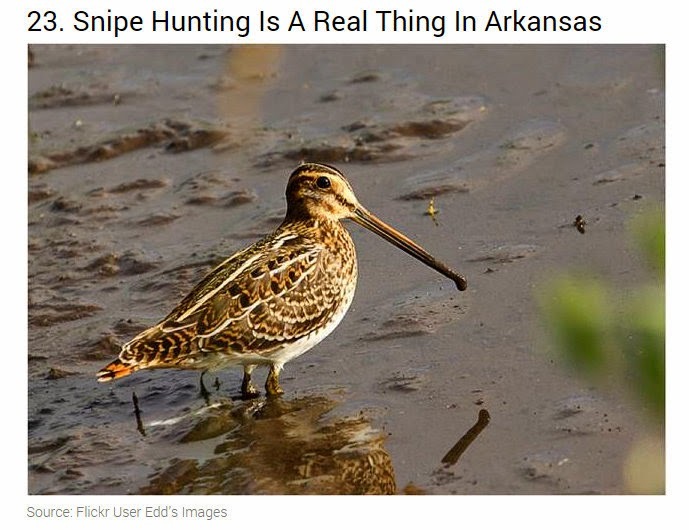 Snipe Hunting Is A Real Thing In Arkansas." Okay, yes, you can hunt the common snipe in Arkansas, according to Arkansas Game & Fish. But that's not what the term usually means here. "24. 'Knee High By The Fourth Of July' Is A Great Thing To Hear." Mr. McKee is once again confusing Arkansas with Iowa. 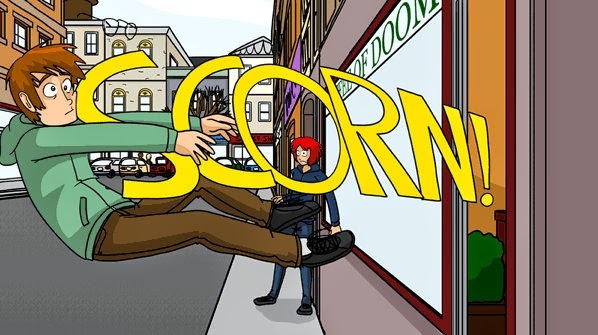 Yeah, corn's grown here. But so's cotton, soybeans, and one heck of a lot of rice. The photo comes from a corn maze at Cuyahoga Falls at Cuyahoga Valley National Park, Ohio. 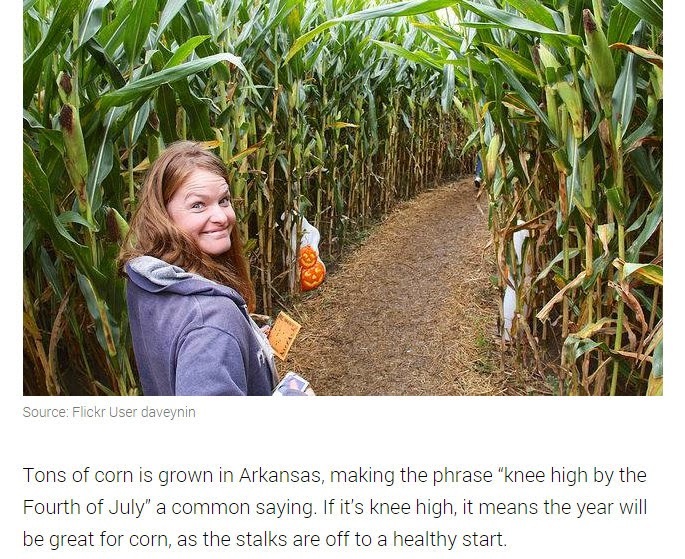 You want to experience a corn maze, there are a bunch that pop up in October. But yeah, we're not Iowa. Or Ohio. "25. 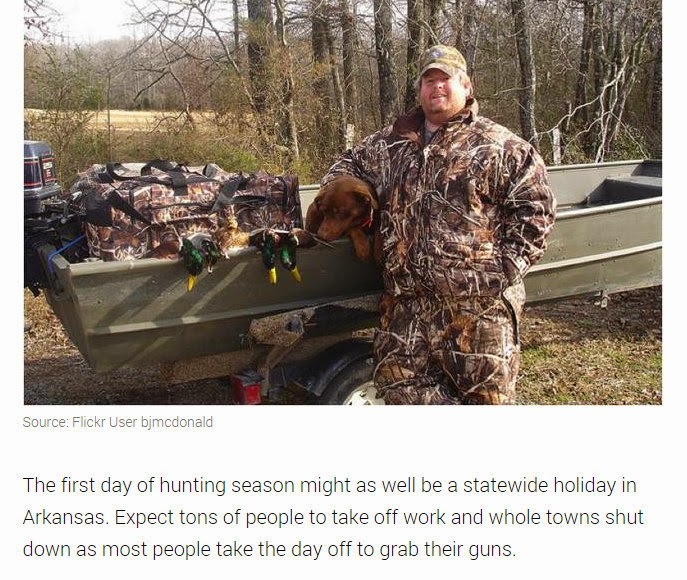 Lots Of Arkansans Coincidentally 'Get Sick' The First Day Of Hunting Season." Hunting season, whether it be duck, deer or some other sort of fauna or fowl, begins on Saturdays. That's by design. Oh, hey, Bryan McDonald. Good morning in Morning Sun, I see. "26. Dinner Is Lunch, Supper Is Dinner." No, not really. I'm sure there may be someone who says that, but in general, no. Also, Heather Katsoulis of West Springfield, MA probably didn't take that photo in Arkansas. "27. The Only Way To Drink Tea Is Ice Cold And Sweet." Nope, nope, nope. Just like everywhere else, people like their tea sweet or plain, and hot tea is awesome when it's cold outside. Hot tea's also pretty wonderful when it's not cold outside, too. You've taken another generalization about the South and applied it to Arkansas, no matter how accurate things might be. That's how misconceptions are spread. Just stop it. And Liz McKibben's photo appeared in the Examiner out of Tampa Bay already. "28. Bug Spray Is A Necessity." No, sorry, not in the city, which seems to be implied from this photo of a mosquito sculpture. Too bad this image was taken by user Wm Jas of Changhua, Taiwan... turns out this is the Suwon City Mosquito Monument in Suwon, South Korea. 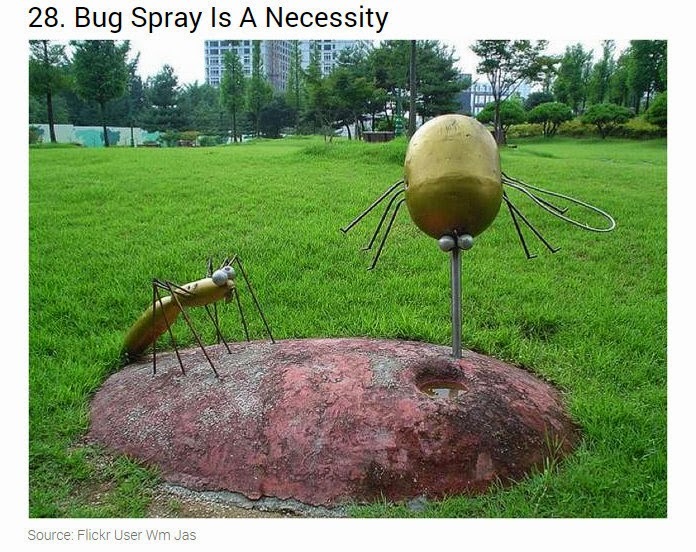 The fact that this article showed a South Korean depiction of a mosquito rather than the real thing kinda negates the entire validity of just about anything here. Of course you use bug spray in the deep woods in the warm months. That's common sense in any state. "29. 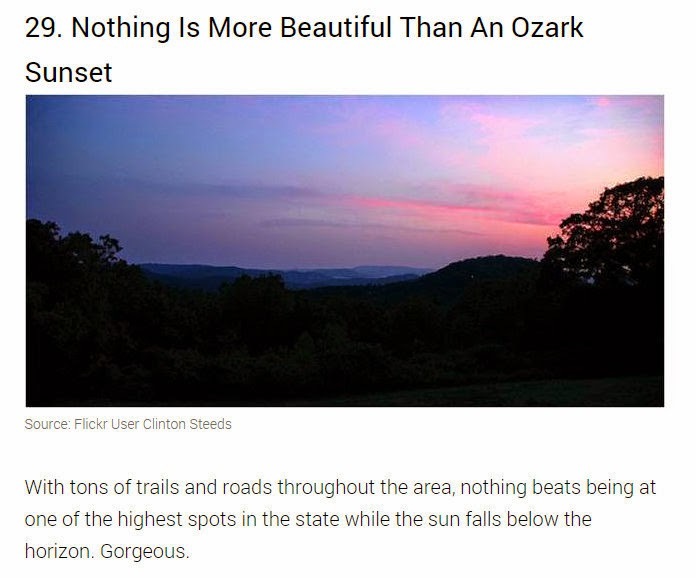 Nothing Is More Beautiful Than An Ozark Sunset." I really wanted this to be right. But no... it's not, not completely. Clinton Steed's photo from Inspiration Point is excellent, though. 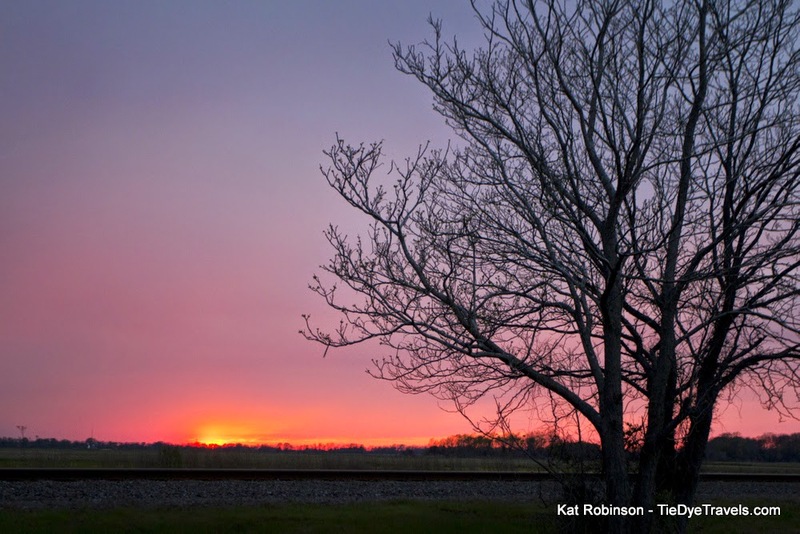 Really, almost anywhere you go in Arkansas, the sunsets and the sunrises are phenomenal. So, Movoto and Mr. McKee... want to have another stab at it, set the record straight? And readers, what do you think? I absolutely love this article! I read the one by Mr. McKee, and thought it was full of barnyard fertilizer. Those awful looking soft drinks from Jolly Rancher and chocolate gravy with bacon bits were nauseating. I am 67years old and have lived here all of those except three which I lived in Dallas . None of what he said made sense and I thank you for setting him straight. Oh boo-hoo. Lighten up. The East Coast crowd makes fun of every state. If you think they were unfair to Arkansas, try being from Iowa. Well I was borned and raised in northeast Missouri. Been here in Hot Springs Ar. area 4 yrs. now. There are many simulations between these two states. Have heard all the jokes about Iowa and Arkansas. Its a really nice place except for that southern gulf humid heat that takes over in summer. Hey Anon why don't you take your own advice. Like you said, every state. She is speaking for ours. You can go write an article about Iowa. Boohoo. THANK YOU!!! (oh sorry for yelling it just had to be said) Saw the original on my news feed and wanted to scream... Friend posted a link to your article and I absolutely loved it!! But considering I go to the university of Arkansas where they care more about a winning team than good grades and all... *gag* I can't even finish that sentence... Well one thing I do have to say, Getting on or around campus is impossible on game day and people drive like idiots.. but I love how you bashed that article and set the record straight. Thanks! Nice job Kat! Only one comment I don't agree with. There are lots of places in the city that have mosquitoes and the use of insect spray can be mighty handy at dusk and dawn if you are sitting outside. I always have a can of Off! handy even in the fall and winter. I swear on warm days the mosquitoes come back to life. I don't understand how but they do. My grandmother in Alabama calls the midday meal "dinner" and the evening meal "supper." I never heard it in Little Rock growing up. Why thank you. I usually feel like a wallflower. #7: I recently gave directions to get a lost traveler from Ft Smith to Hot Springs. I gave him which highways, approximate mileage, and approximately how long it would take him to get to his destination. 3 Things To Order at Yesterday's Bar and Grill. Quick Trips Around Arkansas Via Timelapse Video. 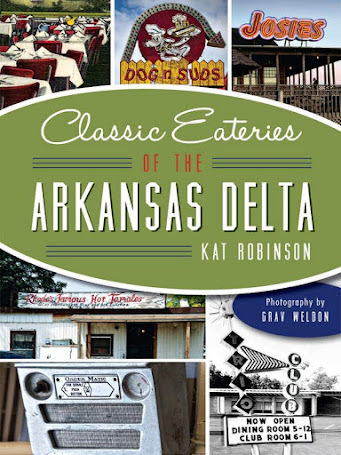 The Oldest Restaurants in Arkansas. Colonial Steakhouse in Pine Bluff Holds Fast. Cajun Landing - Fine Fare of Louisiana. Quick Bite - Renee's Cafe in Black Rock.